RhysD: Okay, here comes my first attempt at posting something substantial. Black is alive. After , a and b are miai for a second eye in the corner. 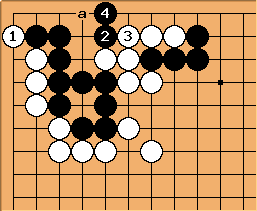 If white plays the hane to prevent an eye in the corner, I think is the only move. 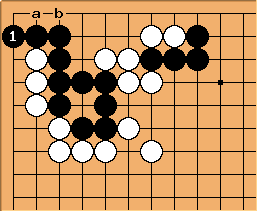 is the strongest continuation for white (Edit: Wrong! I just looked at the solution page. at makes a ko. ), but is a tesuji. Black now has an unassailable second eye at a.